This striking wall quilt and pillow set will add a pop of color to your home decor. 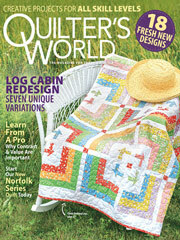 Use strip piecing and one diamond template to stitch all nine quilting blocks. The Amish Log Cabin Pillow is perfect for tossing on a couch! Finished sizes: wall quilt : 39" x 39"; pillow : 18" x 18".